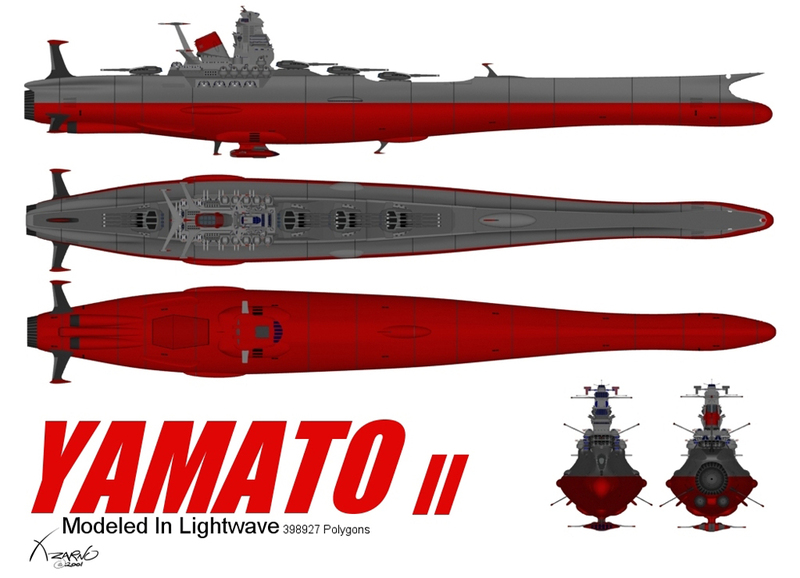 A new schematic of the first version of the Yamato as commissioned on 16 December, 1941. You will notice that, unlike the more commonly known version that was retrofitted several years later and sunk in 1945, the original Yamato was built to take on other battleships, hence the existence of two secondary-style 6.1 inch (15.5 cm) triple turrets on the port and starboard decks, and with minimal anti-aircraft protection. When it was determined that the war in the Pacific was quickly evolving into a dominance of air power, the two side turrets were replaced by a battery of anti-aircraft emplacements when she was dry docked at Kure on 16 January, 1944. And, of course, the Yamato in its final configuration when it was sunk at 1423 hours (2:23 pm), 7 April, 1945 has been updated to a cleaner CG-based image that I found on the web. 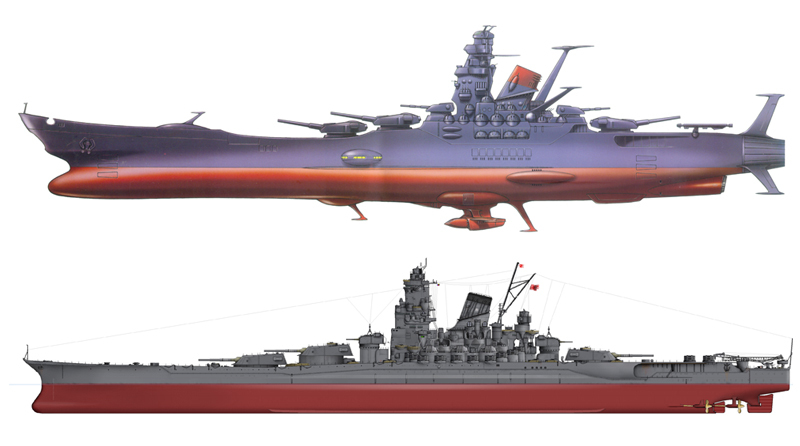 Finally, an updated comparison between the WWII Yamato and the Space Battleship Yamato. This was a modest update, considering the hundereds of ships I've added in the past month, but one I felt needed to be done for a long time. Well, it's hard to believe that it's been a long, dry 7+ years since the last update in the Yamato section. The past 3 years, however, have been a very exciting time for the Yamato fandom! For the first time since Final Yamato appeared in Japanese theaters back in 1983, a new animated Yamato movie was released in 2009 entitled Space Battleship Yamato: Resurrection, bringing with it many new and interesting ship designs (included in this release). It would be Yoshinobu Nishizaki's final foray into the world of Yamato before sadly dying one year later in 2010. Following the somewhat lukewarm release of Resurrection, the crew of the Yamato continued on - this time, in the form of a live-action movie - also in 2010. A re-telling of the first story and reimagining the Gamilons as an odd, almost ethereal race of beings, it was a self-contained story that seemed to owe some of its inspiration to Ron Moore's 2003 Battlestar Galactica in many respects. Despite the similarities, it was a good movie and showed that a live-action Yamato can be done while still being respectful to the source material. Finally, and most recently, a complete reboot of the animated franchise began, starting in 2012, in the form of Yamato 2199. Once again starting at the beginning, 2199 not only retells the original Yamato story, it introduces new ships, new characters and new subplots in stunning detail, fully bringing the Yamato franchise into the 21st century. It has been well received in Japan and it is soon to be released to western audiences in the form of the subtitled Star Blazers 2199 by Voyager Entertainment. I hope to soon have some schematics to show from this new series in later releases. But for now, there is quite a bit to cover. One of the other interesting additions to the Yamato franchise was the publication of the Yamato Fact Files by DeAgostini. Architected much like the Official Star Trek Fact Files, the Yamato Files contained a boatload of ship schematics, many of which helped to flesh out older scans and update the accuracy of many designs. 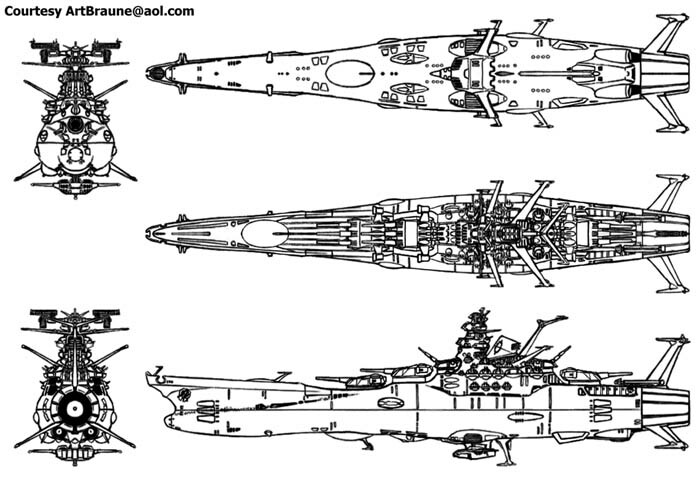 All the schematics were carefully index, cataloged and scanned for this release - several new ones as well, particularly those from Yamato 2199. Small update with Leiji Matsumoto's new "Great Galaxy" incarnation of the original (but still somewhat new) "Great Yamato", but with a decidedly Harlockian-Arcadian flare. Not sure what's going on in Japan right now between the Matsumoto and Nishizaki camps, but after some court battles of who owns what, it would appear that Matsumoto no longer has the rights to the original Yamato property and must now put his "Great Yamato" idea into an "alternate universe" and rename it to "Great Galaxy". It's all very strange. Kind of reminds me of a mish-mash of the Battlestar Galactica fight between Glen Larson and Richard Hatch and the Pink Floyd fight between Roger Waters and David Gilmour. CAN'T WE ALL JUST GET ALONG, PEOPLE?!?! Crimeny! 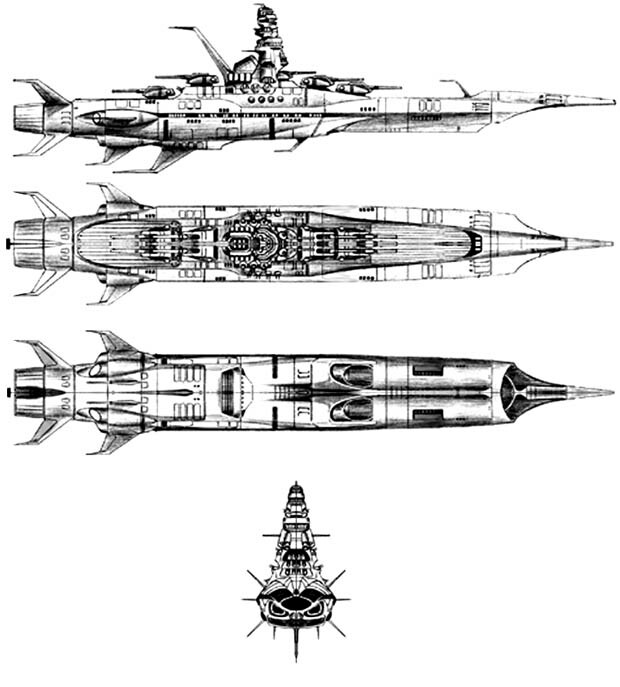 Many thanks to Art Braune for his rendition of the NewType Yamato as seen in the first Fixed Data manual for the Japanese Playstation video game. 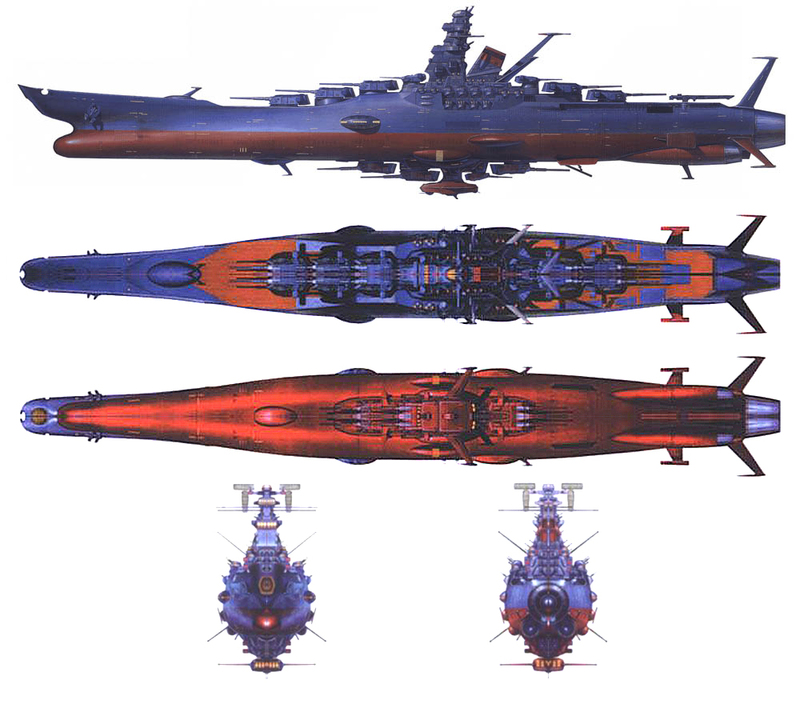 Also, I've added Brian D. Rivers' Yamato Upgrade and compiled three views from Space Battleship Great Yamato which just came out in Japan last year (2001), thanks to some images that were made available by Edward Hawkins at www.spacecruiseryamato.com. One more thing! As it is generally accepted that the universes of Yamato and Captain Harlock are one in the same (some people have even gone so far as saying that Kodai/Wildstar IS Harlock), I have included the Battleship Arcadia - the second (green) one, that is. I have pictures of the first (blue) one, A.K.A. Battleship Alcady, A.K.A. Battleship Alcadia, A.K.A. Battleship Albator, but no schematics as of yet. Still working on it. 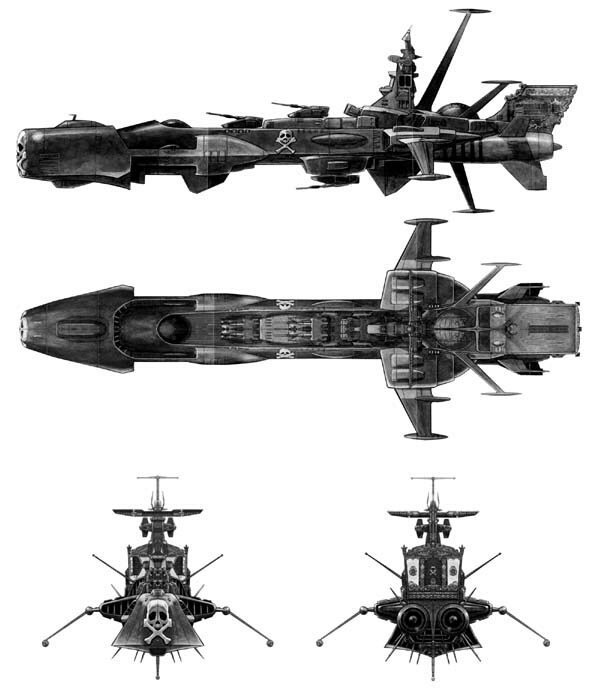 Added Don Gaiser's Yamato II and Brian Rivers' Lazerous to the EDF Capital Ships list. It's an excellent design, logically evolving Yamato to the next phase, while still maintaining its original anime look. Welcome to the new Space Battleship Yamato section! It officially went online at 12:10 AM on Wednesday morning. As usual, it follows in the footsteps of the Star Trek and Battlestar Galactica sections of the database. It was really a trip down memory lane for me, as I remember seeing Star Blazers for the first time back in 1979 and was enthralled. Ever since that time, I've collected a considerable amount of info on the show, discovered that it originally came from Japan, and that the ship's original name was the Yamato. I was quite surprised, especially at that young age.